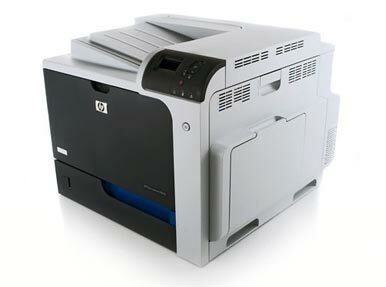 HP's Color Laserjet Enterprise CP4025dn is a workgroup color laser printer with speed and features to spare. Though not quite as fast as Dell's 5130cdn ( ), the HP costs a little less and offers smoother print quality. Its toner costs are economical, too. The CP4025dn is one of the fastest color laser printers we've tested to date. In our tests, plain-text pages flowed into the tray at a sprightly 19.4 pages per minute (ppm), while graphics speeds ranged from 6.2 ppm for simpler images to 1.8 ppm for photo quality on special paper. Print quality was generally very good. Photographic images tended to have a darkish or greenish tinge, which was more pronounced in a grayscale sample. When we moved the CP4025dn to our Mac testbed, it slowed drastically to an average of 7.7 ppm printing text and 2.3 ppm printing graphics. Print quality was consistent with what we saw on the PC platform: smooth and natural-looking, with a few overly dark areas. Built for high-volume use, the CP4025dn has a monthly duty cycle of 100,000 pages and comes with 512MB of memory, upgradable to 1GB. If the standard 500-sheet input tray and the 100-sheet side multipurpose tray aren't enough, for $499 you can add a wheeled base unit that includes another 500-sheet input tray, plus a cabinet for storing paper. The 500-sheet output tray has a spring-loaded bottom panel that lowers automatically as more paper accumulates--a fun design, though on our unit the panel was short on lubricant (according to HP) and squeaked a bit. A front panel opens to provide easy access to the integrated toner cartridges/drums, and a panel on the right provides paper-path access (though we did not experience any jams). The on-board controls are intuitive, and the menus displayed on the four-line color LCD are easy to navigate. The Web-based interface is also top-notch. Most busy offices would be happy with the HP Color Laserjet Enterprise CP4025dn's speed and features, and its smooth print quality is a nice bonus. Those who need even more horsepower and capacity (and can tolerate a little graininess in photos) should consider the slightly more expensive Dell 5130cdn Color Laser Printer. Some graphics can be overly dark.